Hanna Sherriff, daughter of David Sherriff of Aberdeen, Scotland and Caledonia, Queens Co, NS was my maternal Grandmother. This essay, a work in progress, is intended to summarize the history of that family as it is known from Internet research to midsummer 2015. A word on the spelling of the family name: Throughout the records there are many permutations and combinations of the spelling of the Sherriff family name. In both Scottish and North American records those spellings are marked most commonly by four characteristics: i) the standard Sherriff; ii) a common reversal of the vowels to Shirreff; iii) a removal of an "r" and/or an "f" from either of these variations; iv) the addition of an "s" to any of the former models, and occasionally sometimes an "es". Signatures in marriage records often suggest a lack of proficiency in handwriting and it is perceived to follow likewise in associated spelling. For consistency this file will use Sherriff when referring to the family name. Grandmother Hannah (Sherriff) Rice is center-right. The above photograph came to light in Bear River when we were preparing the Alban Riley/Dora (Rice) Riley home for sale in 1990 after Alban’s death. The only decipherable notation on the photo’s cardboard frame was a “Mrs. Forman Rice, Bear River - … - …- Mother and children group for ...”. Further consideration strongly suggested it to be a photo showing mother Hypsobeth (Harlow) Sherriff and seven of her eight daughters. 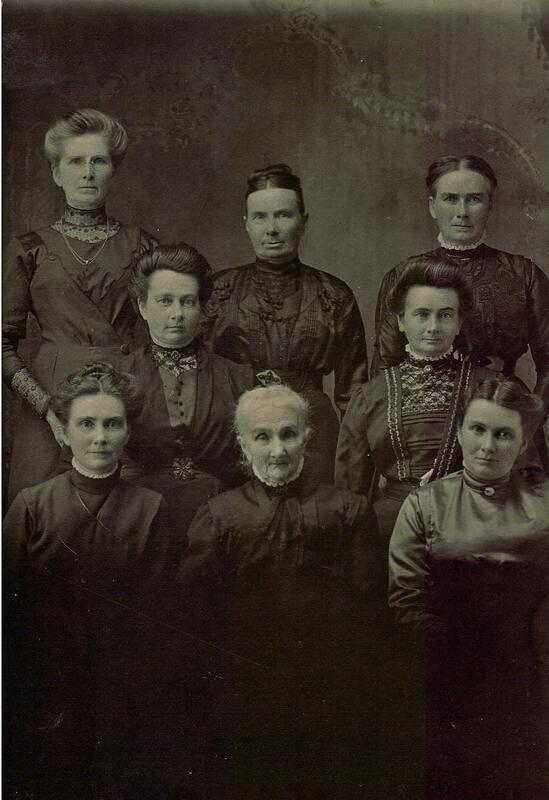 A comparison with other available photos led to the identification of her daughter Hannah as the individual in the middle row right. The age of the photo and where it was taken remained a mystery for several years, but a recently discovered entry in the Sep 10, 1913 edition of the Liverpool Advance celebrating Hypsobeth's 84th birthday (on Sep 2, 1913) and the fact that seven of her daughters were named as being present (Janet of Shelburne County was missing) would strongly suggest that the photo was taken in Liverpool, NS in conjunction with that memorable birthday occasion! Nova Scotia records are clear that the Sherriff family originated in Scotland. Alexander, his sons John and David, and his grandchildren Margaret, and John Gill are all ascribed a Scottish birth in public records; John's daughters Helen and Ann are ascribed a Scottish birth in family records, daughters Georgina and Wilhelmina were born in NS. It would appear from a reference in Notes Historical and Otherwise of the Northern District of Queens County; NS Historical Society 16(1921): 93-135 that Alexander and John Sherriff arrived early to the Caledonia area, specifically at Whiteburn, Queens County. (Because of mining developments after 1886 Whiteburn was often referenced in the late 19th and 20th century as Whiteburn Mines). Information in available Scottish birth records, Caledonia death records, and Nova Scotia census records currently allow the Sherriff family’s arrival to NS to be set between 1827 and 1837. From information on his grave marker in the Lakeview Cemetery in Caledonia we can ascribe Alexander Sherriff a birth year of 1756; he died in 1837. In early April 2015 the following file was discovered on FamilySearch: "Nova Scotia, Queens County, Notes of Thomas Brenton Smith, 1700-1950" Among other information that file contained a September 1955 letter to Mr. Smith written by John's Sherriff's great, great grandson James William Shirreffs (JWS) which set out considerable factual and some speculative background on the Caledonia Sherriff family. In particular JWS indicated that John Shirreffs had arrived in Halifax in 1828 where he was engaged in teaching school for the winter before moving to the Caledonia area in 1829, a date that is consistent with the above calculated time frame. This file had assumed from known ages that John and Alexander were son and father and there is confirmation within family records to suggest this to have been the case. Had they both arrived in 1928 then John would have been about 32 years of age, and his father Alexander about 73 years of age. A transcribed copy of John Sherriff's will in the above referenced file clearly indicates that John and David Sherriff were brothers, and not the initially assumed father-son pair. The significant age difference between the two (~25 years) has been taken by some to infer that they may have had different mothers but there is nothing yet available in the records to confirm that situation. Available Scottish public records would suggest that John appears to have immigrated to Nova Scotia with his wife Isabella Gill and two otherwise identified children - Margaret and John G[ill]. The Thomas Benton Smith file also indicates that in addition to Margaret and John Gill, John and Isabella also immigrated with Scottish-born Helen Anna, and Ann Gill; Scotland-born Isabella Bernie had apparently died in Scotland in 1820 at 2 years of age. Twins Georgina McK and Wilhelmila G were born to John and Isabella in Caledonia in 1930. Wilhelmila died in in 1838 of scarlet fever and is buried in Caledonia's Lakeview cemetery. Correspondence from one Jim Sherriff of Sunderland, Tyne and Wear, England in March of 2015 added some further information to the John Sherriff file - John Sheriffs of Whiteburn, NS was apparently brother and heir to one James Sheriffs, Courthouse Keeper in Aberdeen, who died on Oct 13, 1840. Apparently one John Shirrefs had signed James' will as a witness, and in the will of his wife Isabella (Garrow) Shirrefs there is a reference to her receiving money from one John Shirrefs from America. John’s death record would suggest his birth to have been c 1796, not inconsistent with a John’s Sherriff's recorded 1799 baptism. John married Isabella Gill, daughter of one John Gill, in Saint Nicholas, Aberdeen in 1817 when she was about 25 years of age. Isabella died in Queens Co., NS in 1871, likely at the home of her daughter Margaret Beals in Liverpool, NS. She is buried next to her son John G Sherriff (c 1827-1866) and husband John Sherriff, in Caledonia’s Lakeview Cemetery. A record is available for the baptism of John Gill Sherriff to parents John Sherriff and Isabella Gill in Old Machar, Aberdeen, Scotland on Sep 5, 1826. Scottish records for the births or baptisms of his uncle David and siblings Helen, Isabella, Margaret, and Ann are yet to be found. The 1838 NS Census lists only one household of Sherriffs in the Caledonia area, that being the family of John Sherriff. (Alexander had died in 1837). John’s family was attributed a total of 7 individuals as follows: himself, 1 male 6-14, 1 female 6-14, 1 male >14 who is not head of household, 3 females >14, one of which would have been his wife Isabella. It is likely that the male 6-14 is his son John Gill who was born 1826 who would have been ~12 years of age. Brother David was likely born ~1921 and he would slot into the male >14 who is not head of household. In 1838 surviving twin daughter Georgina would have been ~8 and represented by the female <14. Of the remaining two females identified as >14 the best candidates would be Anna (~14) and Margaret (~17). This assumes that daughter Helen at ~24 years of age would likely have been working out of the family home. The death record of John’s son John Gill indicates John the father had been a merchant; his apparent ready acceptance into the retail business of his son-in-law Arod Beals would support that thesis. There were five land grants issued to members of the Sherriff family in Queens Co north and west of Lake Rossignol. The actual issuance dates are not currently readily available; however, it is suggested the lots were likely granted in a couple, perhaps three, tranches. The likely earliest to David and John (Gill?) in the mid to late 1840s, the second to John et al and to David and Zoeth Harlow perhaps in the 1850s, and the latest to David’s son Alexander sometime in the 1870s. It is not readily apparent that any of these lots were farmed. John Sherriff the elder’s death was recorded in Liverpool, NS in Jan 1870. His death record noted that he had been born in Scotland, that he was 74 years of age (b c 1796), that he had been a Justice of the Peace, that he had died of heart disease, and that both his parents were dead (no first names!). The informant was A Beals, his son-in-law (and, for a short time (1855-1860), his business partner in Liverpool.). John’s was buried in Lakeview Cemetery in Caledonia, NS. James Sherriff was apparently the oldest of the three known children of Alexander Sherriff of Aberdeen and later Caledonia, NS; he was apparently born ~1792 and died in Aberdeen in 1840. At the time of his death he was the Keeper of the Court House in Aberdeen. James was married to Isobell Garrow in Aberdeen's Saint Nicholas church in 1816. Isobell died in Aberdeen in 1846. The couple are known to have had one daughter Mary (she may have been Mary Dawn) who was baptized in Aberdeen in 1817.
o James George William Campbell: George was born in Dartmouth in 1870 and was trained as an engineer. He married Isabella McCullach in Truro in 1904. John died of cardiac failure in downtown Halifax in 1943. James death record notes the couple had at least one offspring listed as J Campbell. · Margret Ann Campbell: Margaret was born in Dartmouth c 1850 and died in Halifax in 1915. In 1886 she married Benjamin McCleve in Dartmouth, NS. · Thomas Campbell: Thomas , a tin smith, was born in NS c1852. o Harris Talmer Austen: Harris was born in NS in 1883 and was employed as a clerk. o Sophia Elliot Austen: Sophia was born in Dartmouth, NS in 1886 and married Harold Austen in that community in 1910.
o Jessie Higgins Austin: Jessie was born in Middle Musquodobit, Halifax Co, NS in 1887 and died in Dartmouth, NS in 1958. She married Francis Dyke in Halifax in 1915. The Dykes has one daughter Elizabeth c1916. Margaret appears to have been born in Aberdeen, Scotland in 1921 and is likely the Margaret Sherriff identified as a teacher in the Whiteburn area in 1848 in Place-Names and Places of Nova Scotia, by C Bruce Fergusson, 1967; she would have been about 27 years of age at the time. It has been reported that the Beals family moved into Queens County from Annapolis County. Calnek in his "History of the county of Annapolis" lists Arod as the third youngest in a family of 11 siblings born to Elijah and Hanna (Banks) Beals. According to an item in the May 31, 1855 edition of the Liverpool Transcript Arod Beals took on Margaret’s father John Sherriff (listed as of Liverpool) as a partner in his provisioning business. The partnership was dissolved in 1860 (John would have been 64 years of age) with Arod reverting to carrying on the business individually. Arod died in Liverpool in 1896; Margaret in that same community in 1900. Margaret and Arod are not known to have had any children. There is a suggestion in one of the histories of Queens County as well as in the Thomas B Smith records that Margaret and Arod appeared to have adopted one Mary Emma Maxwell. Mary Emma appears to have been living with the couple in 1871 and was assigned the surname Beals by the census enumerator; she as a widow and her 15 year old son William Long were residing with the Beals in 1891. There is no other evidence of an adoption, and in fact the news report of Mary Emma’s second marriage in 1894 made no mention of the Beals, both of whom were alive at the time, nor did her subsequent death report. The notion of a formal adoption of Mary Emma Maxwell by the Beals has been discounted in this file; however, she may have been fostered by the Beals c1870. However, there is an Emma Sheriffs in the records with a close affinity to Margaret and Arod Beals of Liverpool: i) Emma Sherriff's son Charles Holloway was living with Margaret and Arod Beals in Liverpool in 1881, ii) Emma's first born was named Arod Beals Holloway, presumably after Margaret Sherriff's husband, iii) Emma married in Liverpool at the early age of 14/15 suggesting family was likely close at hand, and iv) the ownership of the surname Sherriff is singularly suggestive by itself. After consideration of the options this file has attributed Emma Sherriff, b c 1848, as Margaret Sherriff’s illegitimate daughter. Of note John Sherriff's will lists both Emma Holloway and Emma Beals. The will bequeathed $35 to Emma Holloway plus a share of any remainder after all stipulated bequests were honored; it bequeathed only $15 to Emma Beals. · Emma Sherriff: Emma Sheriffs married William Holloway, farmer and sometimes shoemaker, in Liverpool in 1862; the couple moved to Port Medway where Emma had five sons, a sixth son was born in MA shortly after the family’s move to Boston. o Arod Beals Holloway: Arod was born c 1863 in NS. He married Marion Cole in Boston in 1889. Arod spent his career as a policeman in New Bedford, MA. The couple had one child, Ellen “Etta” Holloway was born in Boston in 1891. She married accountant and IRS officer Elmer Ricketson in New Bedford in 1913. Etta died in Providence, RI, in 1972. The couple had one daughter, Marion Ricketson who was b 1917 and died, single, in New Bedford, MA in 2002.
o James William Holloway: James was born in Port Medway, NS in 1864.
o John P Holloway: John was born in Port Medway, NS in 1866; he died in the same community in 1868 from meningitis. o Charles Holloway: Charles was born in Port Medway in 1868. He married 19 year old Minnie Thompson in Boston in 1899. The couple had one child, Rosina Holloway, who at 28 married 61 year old medical doctor Lewis Bump in MA in 1928; Lewis died within the next decade and by 1940 Rosina was supporting herself working in the shoe industry. The MA death index suggests that Rosina may have subsequently married a Mr. Hill. o Reuben Sheriffs Holloway: Reuben was born in Port Medway in 1870. He married Mildred “Millie” Boudreau of NS in Boston in 1896 where he worked as a marine engineer. Millie died prior to 1930. The Holloway’s produced six children, the history of whom is imperfectly known - Florence D born in 1896, William H born in 1898, Ethel May born in Boston in 1900, Viola born in Boston in 1902, Herbert Franklin born in 1903, and Mary Jeanette born in Boston in 1904.
o Joseph Henry Holloway: Joseph was born in Boston in 1873 and died at sea, presumably of a heart attack, while working as a marine engineer out of Boston. Joseph married first NS-born Mary Wheeler in Boston with whom he had a daughter Mary in 1898. With his second cousin Frances Sherriff of Whiteburn, NS he fathered three children, Frances E in Boston in 1905, Joseph Henry in Boston in 1907, and Sarah Letitia born in Whiteburn in 1909. The two US-born children immigrated to Nova Scotia in 1914 and were living with their mother and stepfather in Middlefield, Queens Co, NS in 1921. · John Clarence Davis: John was born in Liverpool, NS in 1845 and died in that same community in 1852.
o Anna Isabella Mccloud: Annie, a music teacher, was born in Boston in 1868. She married Albert Horstmeier in 1886; the couple lived in Boston until Albert's death in 1940 in Boston after which Annie moved to Baltimore where she died in 1947. Albert, b 1869 in Baltimore, was an accomplished painter who in the late 1800s studied in Paris. His works are included in various leading art collections both in North America and abroad. By 1940 Annie's last name was being rendered as McLeod or MacLeod. o Mary E Mccloud: Mary was born in Worcester in 1870.
o Charles L Mccloud: Charles was born in Worcester in 1881; a Charles McLeod was listed as living in that community with an Elizabeth (Mary Elizabeth?) McLeod in 1899. · William Davis: William Davis was born in Liverpool, NS in 1849; he died in Boston, MA in 1861.
o George Sumner was born in Boston in 1874; in 1895 he married Canadian-born Griselda Rolfe in that same city. By 1900 20 year old Griselda and two children, Florence and John L Lane, were living in Boston with her parents. In 1930 Griselda was found operating a boarding house in Boston. o Dorothy Elizabeth was born in MA in 1875. In 1902 she married Reginald Wells, a broker in hides. o John Dow was born in Boston 1878.
o Eva M was born in Boston in 1880.
o Mary M was born in MA in 1888.
o Irving W was born in MA in 1889. · George C Davis: George Davis was born in NS in 1855. · Wilhelmina Davis: Wilhelmina was born in Boston in 1868 and died in that same community some 11 months later. John Gill Sherriff was born in Old Machar, Aberdeen, Scotland in 1826. He died from drowning during a river log drive near Caledonia in 1866. He was buried in Caledonia’s Lakeview cemetery. o Margaret Sherriff: Margaret Sherriff was born in NS in 1872 and died in Middlefield, NS in 1932. In 1906 she married Alfred Kempton in Caledonia, NS, a farmer from Middlefield, NS. The couple had three children in Middlefield, Beatrice Pearl in 1910, married Frank Freeman in 1932, Mildred Noreen in 1912, married George Dowell in Liverpool in 1934, and Jason Wilfred in 1916, married Nancy Bower, died Dartmouth 2012.
o John T Sherriff: John Sherriff was born in Whiteburn in 1875. He died single in Halifax, NS in 1961.
o Frances Nora Sherriff: Frances Nora Sherriff was born in West Caledonia, NS in 1879; she died in Liverpool, NS in 1959 and was buried in Middlefield, Queens Co. Frances Nora initially partnered with second cousin Joseph Holloway of Boston resulting in three children: daughter Frances E b Boston 1905, d 1990 in RI; son Joseph Henry b Boston 1907, married Helen Feener in NS, died Liverpool, NS 2002; daughter Sarah Letitia Holloway b Whiteburn, NS 1909, married Max Martin and produced six children in Middlefield, NS before 1935 as follows: Lester, Mildred married Theodore Lyttle, George, William, Maxwell, and Cyril. Joseph died at sea out of Boston in 1914. As a widow Frances Nora married farmer Frank Morton of Middlefield, NS in 1915 in Caledonia which couple are reported to have produced children Sarah Morton and Joseph Morton. Frank died in 1935.
o James E Sherriff: James E Sherriff was born in Caledonia, NS in 1880. He married Louise Armstrong who was born in West Caledonia, NS in 1878; she died in that community from measles in 1915. James subsequently married Addie Naugler in Liverpool in 1917. James and Louise had the following children: i) James William in 1907 (the JWS who was involved in recording Sherriff family history); ii) Edith in 1909 in Caledonia; iii) Lillian in 1911 in Whiteburn, NS; vi) Edward who was born in 1913 and died in Halifax in 1947; v) Annie who was born in West Caledonia, NS in 1915 and died three days later, nine days before her mother’s death from measles. o Alice Delia Sherriff: Alice Delia Sherriff was born in Whiteburn, NS in 1888; she married Clarence Ball in Whiteburn in 1904.
o Aarod Beals Sherriff: Aarod Beals Sherriff was born in Whiteburn, NS in 1888; he married Hattie Seldon in 1915 in Greenfield, Queens Co, NS. Georgina, occasionally listed as Georgiana, and her twin sister Wilhelmina were born in Queens County in 1830. Wilhelmina died of scarlet fever in early 1838 and is buried in Lakeview cemetery in Caledonia. Georgina appears to have had an illegitimate son Reuben in 1852 whose father is unknown. Ruben's personal record confirms Georgina as his mother but lists his father as John H Sherriff, who was in reality his grandfather. From remarks of family historian of James William Sherriff it appears that Reuben was a personal favorite of grandfather John Sherriff; that favoritism was demonstrated in grandfather John's will in which Reuben was awarded the largest bequest of $400. Georgina subsequently married widower Philip Pierce, a shipwright, in Boston in 1864; there appear to have been no children. The record would suggest that over her later years she maintained contact with the Massachusetts-based Holloway offspring of her niece Emma Sherriff. Georgina died in Winthrop, MA in 1905; she was listed as a widowed boarding house keeper. · Reuben Sherriff: Reuben grew up in the household of his grandfather in the Caledonia area. He is reported to have been an exceptionally good student in the local school system. A newspaper report at the time of his death suggested he had no formal secondary education. In 1870 he was listed as a jeweler's apprentice living in the household of his mother in Boston; by 1880 he was recorded as a civil engineer living in Chicago. He subsequently removed to Richmond, VA from which center he practiced his profession for some years. There is a record of his application for some 5 separate patents in the US Patents office. Reuben married Edith Howard in Richmond, VA in 1884; she died in the 1890s. He subsequently married a much younger Emma Bruce in 1902. There does not appear to have been any children from either marriage. Reuben committed suicide via a gas stove in Washington. DC in August 1904. He is buried in Richmond, VA.
David, a farmer, married 23 year old local girl Hypsobeth Harlow, the daughter of Zoeth Harlow and Hannah Page, in 1850 in Devonshire, a community which no longer exists but which appears to have been the name for a hamlet near Whiteburn. Hypsobeth Harlow was born in Devonshire, NS in 1828 and died in Liverpool, NS in 1925 at the age of 96. · Alexander Sherriff: Alexander was born in 1851; he listed his occupation as carpenter. In 1888 he married Mary Simpson in Somerville, MA and the couple continued to live there until at least 1900. Alexander died in 1911 and is buried in Caledonia; Mary died in 1916 in Milton, NS and is likewise buried in Caledonia. The couple is not recorded to have had any children. o Grace Olive Sherriff was born in Lake George in 1887; she applied for her late registration of birth in 1953.
o John David Sherriff, a farmer, was born in 1890, married Viola Helen Welton in Kingston, NS in 1929, and the couple had one son Frank David Sherriff, born in Lake George in 1926. Frank died in Berwick, NS in 1952. · Mary E Sherriff: Mary was born in 1855. In 1881 Mary had an illegitimate daughter, Ida Mae Sherriff. In 1890 ten year old Ida Mae was in foster care in Kempt, NS and Mary is assumed to have immigrated to the US. The 1900 US census shows Ida Mae to be living in Rockport, ME with her mother Mary and her mother’s partner Levi Saunders; Levi and Mary were reported married in 1890. Levi, considerably older than Mary, died in Rockport in 1913. Mary is reported via the Sherriff Family Bible to have died in 1937.
o In 1901 Ida Mae married one Hartley Watts in Rockport, ME. She died in nearby Union, ME in 1947. The Watts had four children: i) Carrie who was born in Maine c 1905, married Walter Tolman in 1922, and the couple proceeded to have five children – Henry, Fred, Vera, Stanley, and Luella – all in ME in the period 1923-1930; ii) Hollis who was born c 1906 and was married in 1927, no apparent offspring, and died 1975 in New Hampshire; iii) Irene who was born c 1910 and who married John Miller in 1927. The Millers are known to have had seven children – Alice, Vivian, Constance, John, Florence, Sidney, Joseph – in the decade 1927-1937; iv) Esther born c 1912 married Donald Tolman in 1926 and the couple proceeded to have nine children – Harold, Mildred, Barbara, Leola, Betty, Geraldine, Kenneth, Vernon, Alicia – all in Maine, in the period 1926-1940.
o Benjamin Sherriff: He was born in Diligent River, Cumberland Co, NS in 1888 and died in Amherst in 1970. In 1906 he married Sarah Brownell in Advocate, NS and had one child. The couple separated in or before 1912 when he fathered a child with Anna Richards whom he later married in Amherst in 1917 and with whom he had one additional child. Benjamin’s first child was daughter Eunice Sherriff, b 1907 and died 1993. She married Leslie Rector in 1933 in Amherst, NS. Benjamin’s second offspring was Delbert Sherriff born in Pugwash, NS in 1912; he married Ann Johnson in Port Phillip, NS in 1936. Benjamin’s third child was John “Jack” Neal Sherriff who was born c 1916 and who married Mary McKeigan in Amherst in 1935; the couple lost an infant in 1936.
o Ada Sherriff: Ada was born in Diligent River in 1890 and passed away, apparently single, in Advocate, NS in 1950.
o Vertas Marie Sherriff: Vertas Marie was born in Port Greville, NS in 1892 and died in Fox River, Cumberland Co, NS in 1945. In 1909 she married Clifford Wheaton of Salisbury, NB in Parsboro, NS. The Wheatons are reported to have had a daughter Violet (1910-1968) who married Douglas Mahon, and two additional sons. o Purdy Sherriff: Purdy was born in Upper Nappan, Cumberland Co, in 1906 and married Mary Reid in the same community in 1934. · Caroline “Carrie” Margaret Sherriff: Caroline, born in 1861, was the only David Sherriff child who appears not to have married. She also appears to have gone early to Rockport, ME, perhaps following her sister Mary, where she became a domestic and worked for two generations of the same family over at least a 30 year period. Her post-1940 date of death, ostensibly in the US, is yet to be determined. o Martha Hardy was born in Rockland, NS in 1900; she married William Johnston in Liverpool in 1936.
o Loletia Hardy was born in Rockland, NS in 1903; she married Currie Hardy in Shelburne, NS in 1924. Loletia was a school teacher. o Dill Annis: Dill was born in West Caledonia in 1889 and subsequently married. He died in New Westminster, BC in 1975.
o Bertha Annis: Bertha was born and also died in late 1894.
o Vera Annis: Vera was born in NS in 1897.
o Everett Annis: Everett was born in West Caledonia in 1903 and subsequently married. He died in Plymouth, MA in 1976.
o Ethel Rice was born in Milford Corner in 1896. She married John Kellogg in 1921 and the couple moved to Detroit where they raised two children; John died in 1967 and Ethel in 1991. Daughter Lavina was born in Detroit in 1922 and son Richard in 1926. Lavina married Lawrence Inman and the couple had three daughters, Donna, Janice, and Nancy. Richard married Lucilla Keily and the couple had two daughters and one son, Jennifer, John, and Lisa. o Edith Rice was born in Milford Corner in 1897. She married Charles VanTassel of Digby in 1922; Edith died in 1967. The couple had eight children in the Digby area of Nova Scotia: Ruth, had two children - Ernest and Gary - with Donald Turner; Keith, married Barbara Horton and had 11 children - Gloria, Linda, Eugene, Terry, David, Randy, Theodore, Perry, Dale, Calvin, Bonnie; Helen, single, died in a car accident on the French Shore; Donald, married Joan VanTassell with whom he had three children - Lynn, Neil, and Timothy; Ira had two children - Charles and Jane - with Martina Cormier; Shirley married Lois Vidito with whom he had three children - Debra, Kenneth, Craig - , he died in Digby 2009; Barbara married Eric Downey and was living in Downsview, ON in 2009; and Alice who had four children - Karin, Colleen, Katherine, Elizabeth - with Richard Pereira. o Beulah Rice was born in Milford Corner in 1899. She married Leo VanTassel of Digby, NS in Milford Corner in 1920; Leo died in Digby, NS in 1956, Beulah in Bear River in 1961. The couple had three children: son Cecil who married Audrey Handspiker with whom he had four children - Gail, Daniel, Cheryl, Heather; son Clayton who married Geraldine Comeau with whom he had four children - Carol, Joyce, Bruce, Blair; and daughter Doris born in 1934 and who married Atlee Wamboldt in 1956 and with whom she had two children - Marilyn and Ronald. o Rex Rice was born in Milford Corner in 1901. Rex spent most of his life in Massachusetts. He died single in Boston in 1975.
o Boyd Rice was born in Milford Corner in 1903 and died in 1981. He married Milford Corner girl Ruby Milbury and the couple moved to Saskatchewan where they had three girls: Pearle, married Ivan Glass, June, married Hubert Connors, and Bonny Lynn who married Gerald White. Ruby moved back to Nova Scotia with the girls after the couple divorced. o Seretha Dora Rice was born in Milford Corner in 1906. She initially married Leo Krant in Montreal in 1926 and the couple moved to upper New York State where Shirley was born in 1927 (married Lawrence Copeland and had daughters Janet and Anne), Clyde in 1928 (married Sheila Mann and had three children - James, Deborah, and Stephen) , and Thelma in 1930 (married Willis Kelly and had son Peter). Leo died in 1933 and Dora returned to Bear River with the children. She married RCAF serviceman Alban Riley in Quebec City in 1941 and son Ray Riley was born in Bear River in 1942 (married Sonja Boyko and adopted son Christopher and daughter Jill). Alban died in Middleton in 1990 and Dora in that same community in 1994.
o Kenneth Rice was born in Milford Corner in 1910. He migrated to Alberta in the late 1940s where he worked in the tourism and farming sectors. Ken died single in Clairsholm, AB in 1978.
o Max Rice was born in Milford Corner in 1912. He married Alice Dukeshire in 1939 in Bear River. The couple had two daughters, Marilyn who was born in Digby in 1946 and who died in Annapolis Royal in 1950; and Sharon who was born in 1951. Max, Alice, and Sharon moved to Burlington, ON in the early 1950s; both Max and Alice died in nearby Hamilton, ON in 2003. · Isabella Sherriff: Isabella was born in 1870. In 1907 she married Henry “Harry” MacDonald in Liverpool, NS; Isabella died in Liverpool in 1927, Henry, a master mariner, died in Liverpool in 1953. The couple were not recorded to have had any children. · Sophia Beels Sherriff: Sophia Sherriff was born in 1873 and was described in 1911 as a tailoress living with her sister Isabell and husband Harry. In 1918 at a stated 45 years of age she married 49 year old English immigrant and Baptist Minister Joseph Hutton in Half Island Cove, Guysborough Co, NS. Joseph had earlier lost both hands; however, he was exceedingly resourceful and apparently an accomplished poet and author. The couple are known to have travelled back and forth to England at least twice, eventually settling there c 1930. Thomas died in Leeds, England in 1956; Sophia likewise died in Leeds in 1965. The couple is not known to have had children. o Ann Ritchie: Ann was born in NS in 1909 and was noted as a 12 year old in the 1921 census. She appears to have died in Halifax, single, in 2004 at 95. · Hypsobeth was the first of four female children born to Caledonia farmer Zoeth Henry Harlow and his wife Hannah Page, the daughter of Eli Page and 'Peney' Freeman, herself from another of the 'old' families of Queens County. It was Hypsobeth's younger sister Eliza who in 1881 married as his third wife Benjamin Rice of Bear River; undoubtedly this relationship was eventually responsible for the liaison and the 1894 marriage of Hypsobeth's daughter Hannah, and Eliza's niece, to Eliza's stepson Forman Rice of Bear River. · Zoeth Henry Harlow was born in Liverpool in 1802. In 1828 at 26 he married Hannah Page in Liverpool and the couple proceeded directly to the Caledonia area where Zoeth took up farming. He remained in the Caledonia area and the farming profession until he died in 1883; his wife Hannah died in 1875. · The Caledonia Zoeth Harlow was the eldest son of an earlier Zoeth Harlow and his wife Experience Hopkins. Zoeth the elder was born in Liverpool in 1778 and died in that same community in 1856. His wife Experience was born in Liverpool in 1788 and was reported to have died in 1864. The couple was reported to have had three children of which Zoeth Jr. was the oldest. · Zoeth the elder was the youngest of eleven children of Robert Harlow and Jane West. Robert Harlow and Jane appear to have married in Plymouth, MA, and subsequently immigrated to Liverpool from Plymouth with three children in 1760. Their first Liverpool-born child was Silas in 1762; he died in 1780 during the US Revolution in an July skirmish off Halifax Harbour between a British privateer out of Halifax on which he was crewing and a Boston-based privateer seeking to do damage to the British cause emanating out of Britain's most active North American port. · Robert was the Harlow who led a branch of the Harlow clan to Liverpool, Nova Scotia in 1760; he was himself the son of another Robert Harlow. This elder Robert Harlow is reported to have been born in Massachusetts in 1688 and to have married Elizabeth Cole of Massachusetts in Plympton, MA in 1717. Elizabeth and Robert had 14 children of which 10 survived to adulthood; son Robert of Liverpool fame was the sixth-born of the 14 Harlow siblings. · The elder Robert Harlow was the son of William Harlow and Lydia Cushman and the eighth of nine children born to the couple. William is reported to have been born in MA in 1657 and died in that state in 1711. Lydia was the daughter of Thomas Cushman and Mary Allerton and was born in Plymouth, MA in the 1660s; she died in Plymouth in 1719. · Thomas Cushman arrived in Plymouth, MA, in 1621, accompanied by his father, on the ship Fortune which was designed to add the second influx of pilgrims into the Plymouth colony generated the previous fall via the first voyage of the Mayflower. Thomas, who lived to 85 years of age, married one Mary Allerton, daughter of Isaac Allerton and Mary Norris, all three of whom, along with two additional Allerton children Bartholomew and Remember, arrived in Plymouth on the Mayflower in November, 1620. Mary is reported to have been born in Leiden, Holland c1616; she is also reported to have married Thomas Cushman in Plymouth c1636. The couple is reported to have had eight children, the youngest being Lydia who married William Harlow. Mary died in Plymouth, MA in November 1699; she has been acknowledged as the last surviving Mayflower passenger. · Mary (Allerton) Cushman is the writer's 6th Great Grandmother.